A uranium mine, a sacred mountain, and a tribe’s struggle to protect its drinking water. Underneath a white big-top tent on the Kaibab National Forest, Rex Tilousi, a respected Havasupai elder, uses a walker to make his way up to the stage. 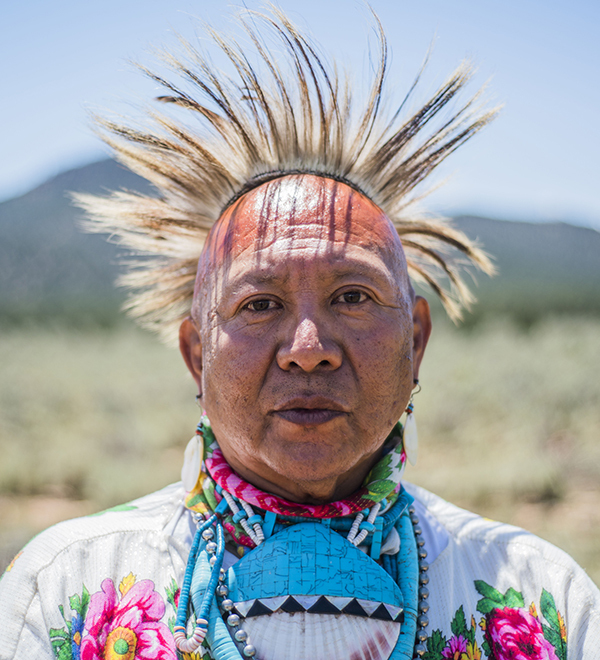 The former tribal chairman moves more slowly these days compared to when he led the Havasupai Tribe in the fight against Grand Canyon uranium mining in the 1980s, but his devotion is the same. Red Butte stands in the background, volcanic rocks topping its crimson bulk. He speaks into the mic, addressing the crowd of mostly Havasupai tribal members. Red Butte is the birthplace of the Havasupai people, their place of emergence and traditional winter camp for hunting and gathering before the U.S. government relegated them to Havasu Canyon in the late 1800s. Now a uranium mine sits in a sagebrush-studded meadow less than five miles from their sacred site and about 10 miles from the south rim of Grand Canyon National Park. Tribal members have organized this four-day prayer gathering in opposition, rising each morning before dawn to walk 3.6 miles in peaceful protest to the security gates at Canyon Mine. Richard Watahomigie, a Havasupai tribal councilman, hopes their message is being heard. With billows of clouds obscuring the highest point in the state this hot June morning, it certainly seems as though the air is swirling with Havasupai prayers. Canyon Mine sits on top of the deep Redwall-Muav Aquifer and shallower “perched” aquifers, which feed the seeps and springs in Havasu Canyon. Coleen Kaska, a tribal councilwoman, says the beautiful turquoise water in Havasu Canyon is a blessing. Her ancestors have told her that while you don’t see the water on the surface near Red Butte, it runs under the earth to their village. The Havasupai are worried, given the toxic legacy of uranium mining on the Colorado Plateau, that the mine could contaminate their sole source of drinking water. This is not the first time the Havasupai have prayed, danced, and drummed at the base of Red Butte in opposition to uranium mining. The tribe has been actively fighting Canyon Mine since the 1980s, when they first learned of plans to extract uranium ore from their aboriginal lands. Tilousi said by the time they got word of the mine decades ago, the company had already scraped clean the ground where their ancestors once lived. The tribe challenged the Kaibab National Forest’s decision to approve Canyon Mine in 1986, but they lost their appeal in federal court in 1991. The volatile uranium market, though, would prevent the company from drilling the mine shaft and hauling ore. When the uranium market finally rebounded in the late 2000s, a frenzy of new uranium claims popped up in the greater Grand Canyon region. Canyon Mine threatened to reopen in 2009, prompting the Havasupai to gather at the base of Red Butte to conduct prayer ceremonies and raise awareness of uranium mining around the Grand Canyon. Now, eight years later, gathered in the same spot in the shadow of Red Butte, the Havasupai are again praying for their sacred mountain, water, and future generations who will inherit this fight. “It’s just the same as it was then. Every time they [the mine owners] bring the issue up, or make a new development, we’re not going to let it happen. We’re not going to give up,” says Watahomigie. While the persistence and stance of the Havasupai Tribe have not wavered in the eight years between gatherings, a lot has changed in the intervening years. Red Butte became a traditional cultural property, a designation that requires tribal consultation for any federal development that could impact the site (uranium mining, for example). The U.S. Geological Survey found that 15 springs and five wells near uranium mines in Grand Canyon watersheds have dissolved uranium concentrations that exceed safe drinking-water standards. And, in 2012, then Secretary of the Interior Ken Salazar issued a 20-year mineral withdrawal, banning all new uranium mines around the Grand Canyon. Despite these advancements, the Forest Service has allowed Canyon Mine to resume operations more than 30 years after its original approval without a single revision or update to its 1986 plan of operations. The Havasupai Tribe, the Grand Canyon Trust, and others are challenging the Forest Service’s decision in court, asking for tribal consultation and a new environmental impact statement evaluating the mine. The 9th Circuit Court of Appeals heard oral arguments in the case in December 2016, and the final ruling is expected any day. In the meantime, operators at Canyon Mine have perforated many of the shallow aquifers in the final stages of drilling the mine shaft. An already-full containment pond meant the owners needed to find some place to put water that had filled the shaft. So, water cannons shot sprays of radioactive mist into the air this April — an attempt to speed up evaporation. Tests of the pond water show a dissolved uranium concentration more than four times the federal drinking-water standard. “The water that we’re trying to protect is not just for our benefit. It’s for everyone’s benefit,” says Kaska. Over 26 million people across the Southwest depend on the Colorado River for drinking water, and while the aforementioned lawsuit might not stop Energy Fuels Resources from extracting uranium ore at Canyon Mine, it could force the Forest Service to take a fresh look at the mine and acknowledge a quarter-century of new information, requiring monitoring wells to be put in place. Currently, the best protection against uranium mining around the Grand Canyon is the 20-year ban on new claims. But it’s temporary, and at risk of being overturned. One of President Trump’s executive orders calls for a review of Obama- era energy regulations, and it’s possible that a reversal of the uranium ban could make it onto the final list of recommendations coming out of the Department of the Interior. In eastern Arizona’s Mohave County, the board of supervisors wrote a letter asking Secretary of the Interior Ryan Zinke to lift the ban. And not surprisingly, the National Mining Association and others are fighting to get it tossed in court. The 9th Circuit Court of Appeals should issue a ruling at any time. Kaska, though, sees a disconnect between lawmakers and her people in Supai village. Decades have passed since the Havasupai first started fighting Canyon Mine, the mark of time showing in the greying hair of early activists like Tilousi and Kaska’s father, Daniel, who sits in a wheelchair in the audience now, but eight years ago was on stage leading songs and dances. A changing of the guard is happening here at Red Butte, as new leaders prepare to take on the tribe’s challenge. The fight is far from over. Some kids are giggling and running around the tent when James Uqualla, a cultural leader, calls them up front. They stand at attention and later join hands with elders in a circle dance, shuffling clockwise, in unison, to the steady beat of Tilousi’s drum. As the dance continues, a few young girls chant “leave it in the ground” an octave higher than the other rally calls. Old and young alike, the Havasupai are committed to protecting Red Butte and the waters underneath it. Kaska’s father once told her that it’s going to be hard, and it’s going to take years. “We’re still in the fight, we’re still in the struggle, and we will continue to do so as long as the water runs through our village,” she says. When she's not writing, Communications & Outreach Associate Ellen Heyn is hitting the trails for the Colorado Plateau Explorer. James Uqualla, Havasupai cultural leader. 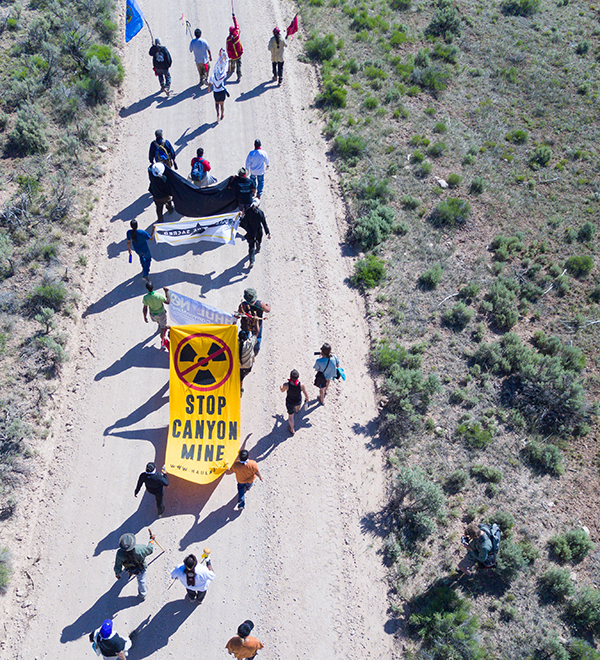 Protest march to Canyon Mine. That's what we're here protecting — the water that we don't see but know is here. Is Grand Canyon Escalade the Next "Savior"? Have the Advocate delivered to your doorstep.